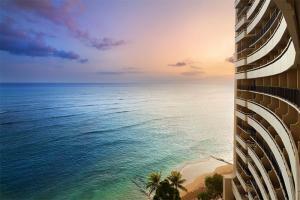 Located on the best stretch of legendary Waikiki beach - trendy, sophisticated, Hawaiian, and completely refreshed after a recent 200 million dollar transformation, this resort ushers in a new level of comfort, style and panache to the Waikiki scene, promising an inspired vacation for one and all. The resort is known for its breathtaking ocean-front views offered from 80% of the newly transformed guest rooms and suites, Helumoa resort "super pool", adult-only infinity Edge pool, award winning dining venues and sophisticated Leahi Club Lounge. On Waikiki Beach, next to The Royal Hawaiian. Approx. 30 minutes from the Honolulu Airport. Rum Fire, Kai Market, Edge Bar, Ingredients, Yoshiya, Leahi Club Lounge, In-room dining.